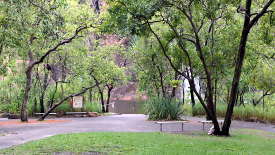 Wangi Falls is a popular picnic and swimming destination with good facilities and spectacular bush walks. During the dry season it can even be a bit crowded as people come from Darwin to swim in it's cool waters. 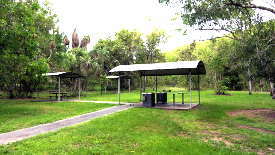 Now while Litchfield Park is a tourist mecca in the dry season, it can be very different in the wet season. Sometimes roads are cut by heavy rain and sometimes swimming is closed by torrents of water that make water holes dangerous. This year my wife and I decided to show a friend around the park on New years day, making it my first visit in the wet season. While there have been localised thunderstorms, the monsoon rains hadn't kicked in so there was a good chance at least the roads would be open. 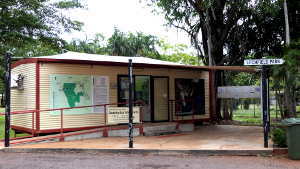 After an hour long trip from Darwin we arrived in Batchelor around 3pm, having been delayed at the airport for longer than expected. The town was almost deserted (well it was New Year), although the Tourist Information Centre was open. Batchelor has a history going back to the early 20th Century when an experimental farm was established in the area, however it's use as a major military base and airfield during WWII and the operation of the Rum Jungle uranium mine underpin it's establishment. 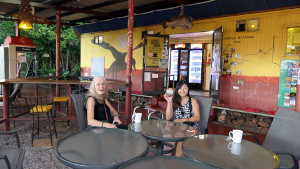 After a quick look at the old mine, we stopped at the Banyan Tree caravan Park for a cuppa as the thunder and rain started. Small but heavy storms are common during the build up to the real wet season when the monsoon rains and this was no exception, lasting just long enough for us to enjoy the coffee. 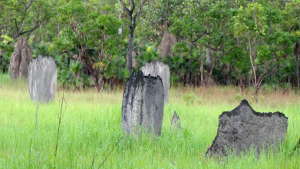 Magnetic Termite mounds (foreground) with larger mounds in the trees. With only a brief stop to take a snap of the termite mounds along the way, we pushed on to cover the 60 or so K's to Wangi before it was dark. 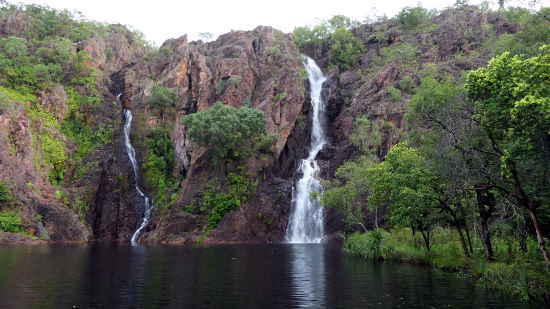 If time permitted we could have stopped at Buley Rockholes and Florence falls, both are well worth a visit and are popular swimming destinations. Arriving at Wangi falls we found the car park completely empty! Definitely a new experience at this popular spot. 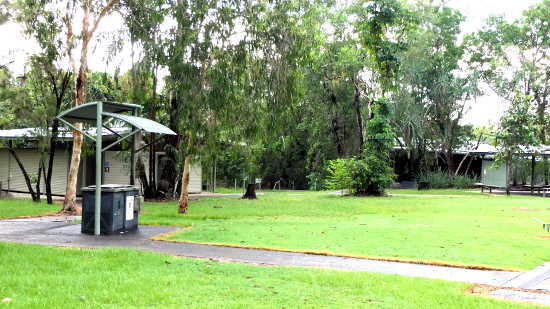 A modern cafe building, toilets, BBQ and an information booth spread around well kept lawns and gardens greet the visitor. The only occupants this time were a few small wallabies. 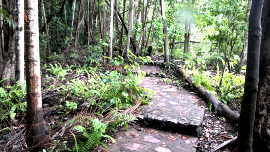 Built walkway to the rainforest walk. 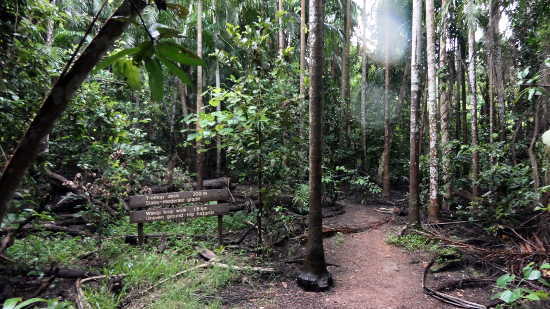 We could still have had a swim in the pool, however the attraction of a walk through the natural rain forests in wet season conditions was much stronger. 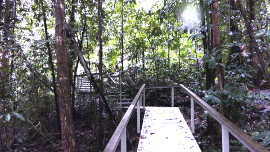 A steel walkway crosses the downstream water and heads into the rainforest. 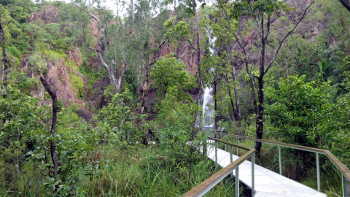 There is an option of a 300m walk to a lookout, or a 1.6k walk across the top of the falls and back down the other side. 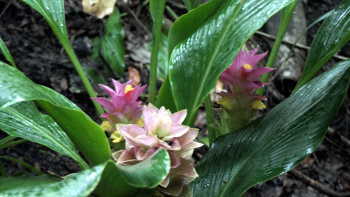 Native Ginger shoots after the first rains and dies back to a bulb in the dry season. Along the way there will be different things to see depending on the season and the time of day. 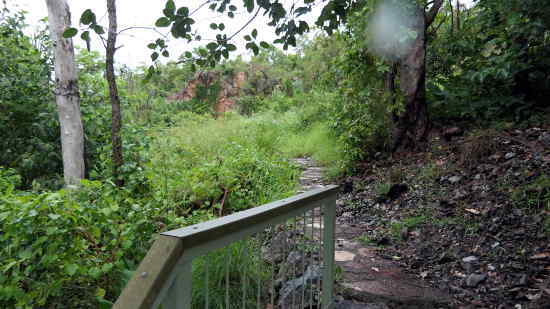 Climbing the stairs brings you to the viewing platform at the end of the 300m walk signposted at the base of the forest. 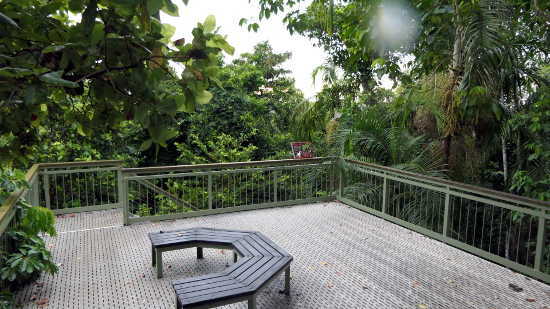 Now the birds and treetops are almost close enough to touch. Past the viewing platform the trail winds on upwards to take you over the top of the falls and back down the other side. Onwards and upwards towards the top of the falls. With light rapidly fading this was deemed a hike for another day. so we headed back down to the car park and on to Darwin. 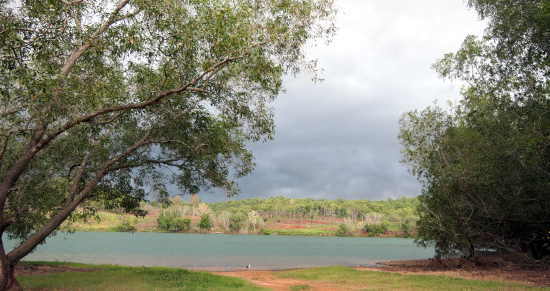 The option is either to travel back along the sealed road through Batchelor to the Stuart Highway or to take the road towards berry Springs. The Berry Springs road would normally be closed during the wet season at the Finniss River crossing and also has around 24k's of fairly rough dirt road.